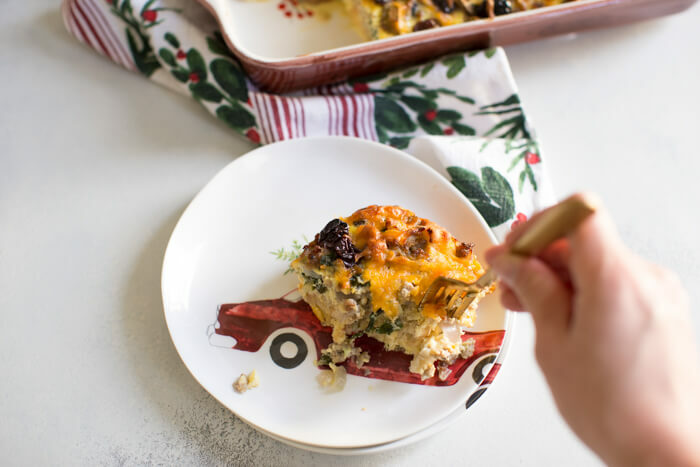 You guys if you’re a fan of easy and love cheese, bread and breakfast sausage with a little sweetness on top, this recipe for Christmas Breakfast Strata is for you. 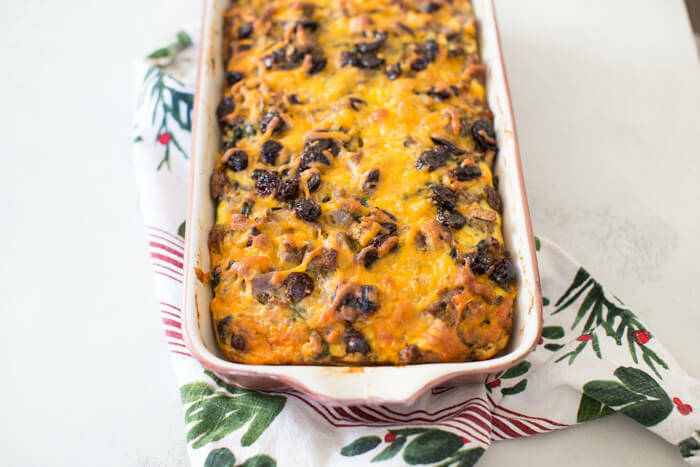 This is an easy overnight breakfast casserole because you literally make everything the night before and on Christmas morning, you stick the casserole dish in the oven and get to smell it baking while opening up presents. Ahhh the Christmas morning life. I’m sure all that will change when the babe gets a bit older and can’t wait to go downstairs to see what Santa brought him. This Christmas Breakfast Strata is all I want to eat on Christmas morning. This easy overnight breakfast casserole has all the things– sweet, savory, comforting, warm… ahhhh! I can eat this casserole any time of day… in fact I have been the last few days. Perks of writing a food blog– you get to eat Christmas food early!! I hope you and your family have a very Merry Christmas and holiday season!! 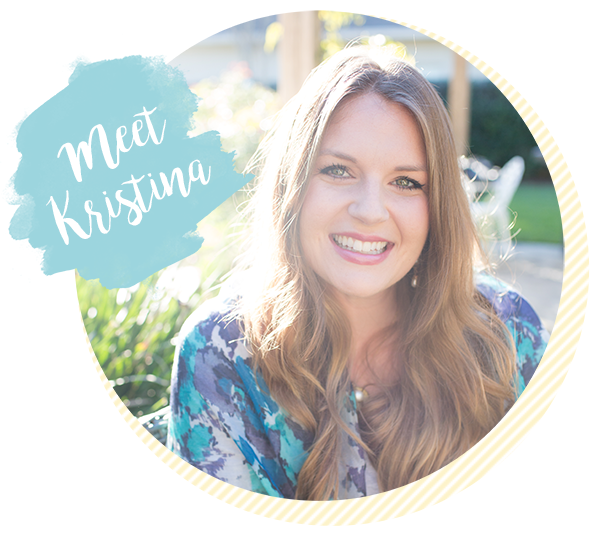 If you give this Christmas Breakfast Strata a try, please take a pic and tag me on Instagram @KristinaLaRueRD using #loveandzest so I can see your creations! 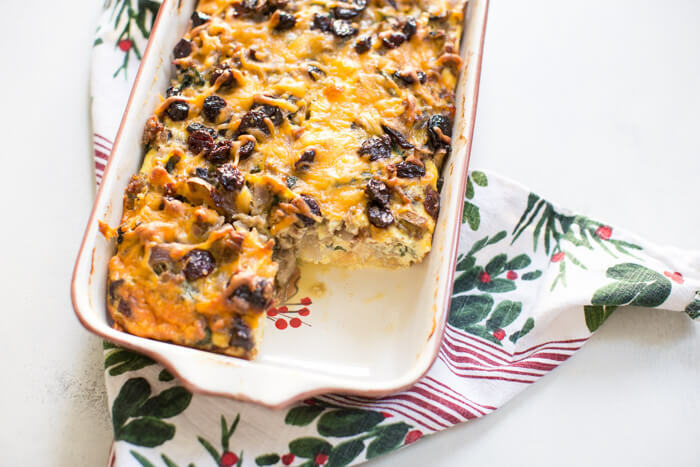 Christmas Breakfast Strata an easy overnight breakfast casserole made with eggs, sourdough bread, chard, mushrooms, and all dat cheese with cherries on top! I just noticed that the instructions in the recipe don’t say anything about assembling the dish the night before. Can it go straight from the fridge to the oven? Is the cooking time the same? You had me at cheese and bread!! The cherries are such a tasty addition here! This looks great! We usually make a French toast casserole for Christmas morning. So yummy! What a perfect breakfast for the holidays! This looks so delicious and I bet the entire family would love it!!! 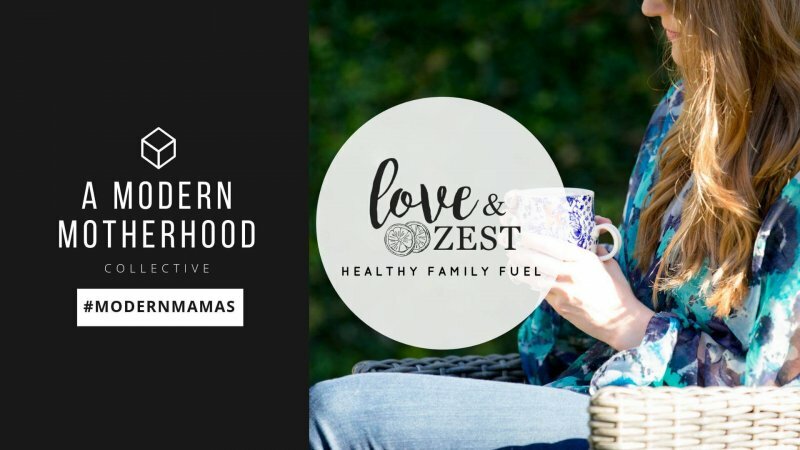 Love easy breakfast options like this! 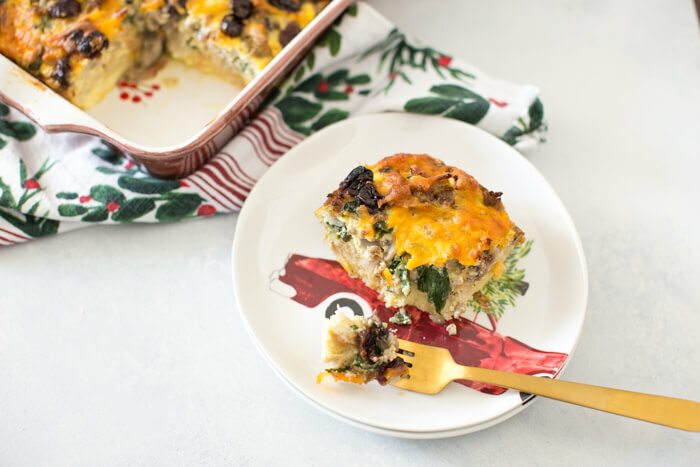 This strata would be a perfect addition to our Christmas brunch! My lord, would my family love this for Christmas Breakfast!! I actually have all of the ingredients, as well! Thanks for the inspiration! !